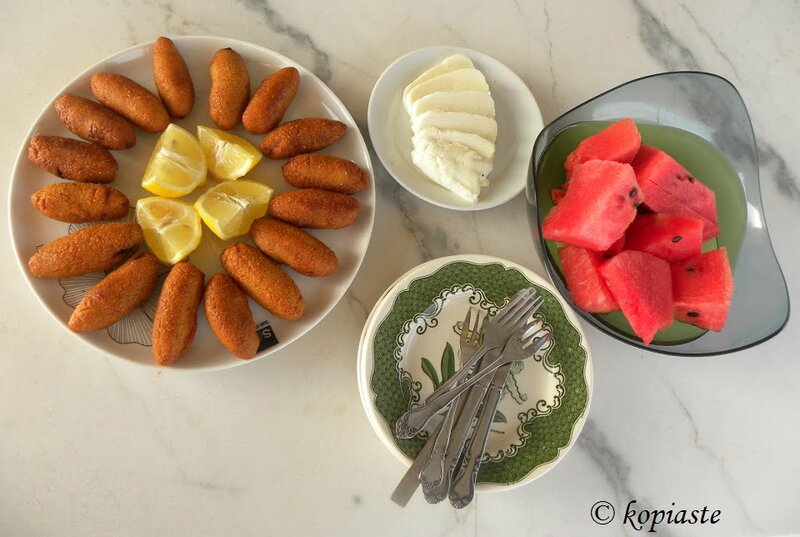 Koupes, (found also in other countries under the name kibbeh, kibbe, kubbah, kubbat), is a street food we find in Cyprus, which is served as a snack, party finger food or as part of a mezes dish. Its crust is made of bulgur wheat, flour, oil, salt and egg (optional) and stuffed with ground meat, lots of onions, parsley and spices. Actually the ones sold by street vendors were mostly with lots of onions and parsley and less minced meat. One of the most common places we used to find them as children, was on Sunday mornings outside the Church yards. I am not sure if you can still find them outside churches but I know that they are now sold in supermarkets, in bakeries or in confectioneries and you can definitely find them at panigyria (fairs). There are two ways to shape them. You can shape them by hand, which is the traditional way or use a machine for koupes. In order to shape them by hand, you take a small piece of dough and shape it into a ball. You then put your index finger in the middle and form a hole. Then you shape the koupes on your finger trying to give it an oblong shape and simultaneously making the shell thinner. After adding the filling, you seal the hole by pressing the dough. The machine I have is very old, as it used to belong to my mother. Actually, this machine was a meat grinder with other attachments, as a sausage maker, as well as one for making koupes. The shell comes out in the form of a cylinder. You can cut it as long as you like but around 10 – 15 cm is a good length. Of course, you have to seal one end before adding the filling and then when done, seal the other end as well. Although I tried to buy another one during one of my trips to Cyprus, I did not find one. In Cyprus you can find two kinds of bulgur wheat. One is semi coarse, used for pilaf and the other one which is much thinner is only for koupes or tabbouleh. I usuall bring some with me whenever I visit Cypus, as the bulgur wheat I find in Greek supermarkets is much coarser than the above two types. I have tried several times to make them and this was my third attempt. The first was a total disaster and the second although they tasted good, they lacked appearance as they cracked during frying. After a few attemps I finally managed to make them but they were not perfect. I have left an older photo so that you can see how they turned out. However, when I visited Cyprus in October, I remembered to ask my sister how she makes them. Evidently, the secret is to keep your hands wet with water when you shape them. This way they are formed easier and do not crack when frying them! Instead of minced meat, I have also made them with sausage filling. The remaining ingredients are the same as with minced meat. I have also made them with leftover roasted turkey meat. During Lent, we can also make them vegan, without the egg in the shell, filled with mushrooms or olives. The olive filling is similar to that for eliopitakia. Koupes, is a street food we find in Cyprus, made of bulgur wheat and filled with ground meat, which is served as a snack or as part of a mezes dish. Mix the bulgur wheat with the flour, oil and salt, then add hot water, gradually and mix again, adding water until there is no trace of water or bulgur. Cover and set aside until it has cooled. Meantime, heat olive oil in a skillet and sauté the ground meat. Add the onions, salt, pepper and cinnamon. Add ½ cup of water (or wine) and stir until all the water has been absorbed. Remove from heat and mix in parsley and set aside to cool. Add the eggs to the bulgur and knead the dough well by hand but if you have a stand mixer, it is advisable to do this in a mixer with the hook attached. If using the mixer, initially mix on low speed, stopping a couple of times to push the dough to the centre, as the dough may stick to the sides of the bowl. Continue mixing and gradually increase its speed until the dough does not crumble and feels soft and sticky, when pinched. Take a small amount of dough the size of a large walnut and form it into a ball. In one hand hold the dough and with your other hand using your index wet your finger make and make a hollow in the dough, elongating its shape and trying to make it as thin as you can without breaking it. When doing this, wet the fingers of your other hand as well. You can also make the shell with a meat grinder if it has an attachment to make koupes. When it comes out of the meat grinder stop when it is about 9 cm (3 ½ inches) long and cut it with a sharp knife. Wet your index and put it in the shell. Wet your fingers of your other hand and close the hole by shaping it into a pointed end. Insert a teaspoonful of filling. Use the back of a small spoon to gentle push the filling inside and continue adding leaving about a centimeter and a half (half an inch) void. Wet your fingers again and seal the opening. If the dough is not enough, just pinch a small amount of dough and wetting your fingers try and paste it together making pointed ends. If at any point you see the shell cracking, again wet your hands and by gently “massaging” it will stick together again. (At this point you can freeze them). Heat enough oil in a pot so that koupes are covered during frying. Fry them on high heat, preferably on a gas stove. Gently turn them around until golden on all sides. Place on kitchen paper to absorb excess oil. Serve hot squeezing a few drops of lemon juice. In order to freeze them, place them on a tray in one layer and cover them with cling film. When they become hard you can remove them and store them in zip lock bags but with caution as they may break. Just heat the olive oil well and fry them without defrosting them. The recipe is included in Volume 2 of my e-cookbook “Mint, Cinnamon & Blossom Water, Flavours of Cyprus, Kopiaste!”, available on all Amazon stores. You can hover over this image to pin it to your Pinterest board. Please feel free to share it with your friends and fellow bloggers, using the share tools below. Ivy, I don’t think I’ve ever tried Koupes, noted and a future meze. This is a very common Arabic dish called kibbeh, kibbe, kubbah, kubbat, kofta, kofte, kufte. It is made all over the middle east, Armenians and Turks also make it a lot. As you say, it is difficult to make the thin shell hold together. I’ve often made a similar recipe as it is quite a tasty dish, though kind of a pain to make. Fine bulgur (size #1) is what you need to make this. I don’t know about putting larger bulgur in the spice grinder to make it like semolina – I think that would be too fine for kibbeh. But good luck if you decide to try it! Thanks Laurie for the information. I have already added a link which I found after your help. Eva, don’t forget to wet your hands. I think that it is more important than the flour and the egg. I can't read the recipe, but we add an egg in the bulgar wheat. That keeps the koupes from opening up when they are getting fried. I bought these from a market stall at Larnaka market they were made by an old lady useing a family recipe they were the best thing i have ever tasted !!! The best koupes i have had was from my grandmother.. she raised the bar so high that no one so far seems to get even close. Yours look nice too..